From Goodreads: Finding your unique voice in a noisy world can be hard—very hard. But not if you have a great guide! The Girl Guide: Finding Your Place in a Mixed-Up World is a must-read for girls in grades 6–8 as they enter the tumultuous world of adolescence. Packed with fun worksheets and quizzes, as well as stories from older girls and women, The Girl Guide covers everything a teenage girl needs to know on the journey toward her own identity. Proven strategies for dealing with stress management, confronting relational aggression, being safe online, navigating the changing mother-daughter relationship, and more make this the ultimate guide for any girl to get through the teen years and discover her unique point of view in the world. When I was a teenager, I loved books and magazines that had specific places blocked off for me to write down my thoughts and reflections. The Girl Guide has tons blank charts and empty bubbles and open lines for lists — it made me want to grab a pink feathery pen and get to work! As if that’s not enough, this book includes all sorts of strategies for coping, living confidently, finding and giving social acceptance, and leading a healthy lifestyle, all discussed in clear, well-organized chapters. But my very favorite parts of The Girl Guide are the quotes from real teenagers, and the bits of advice offered by mothers, pastors, youth leaders, and writers like Gretchen McNeil, Jessi Kirby, and Stasia Ward Kehoe. 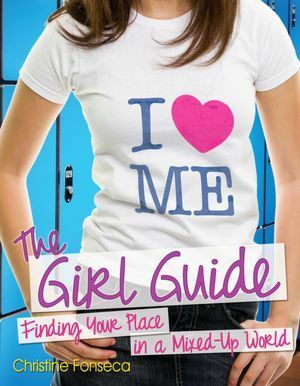 I’m going to make sure I have a copy of The Girl Guide: Finding Your Place in a Mixed Up World on hand to give my daughter when she’s in middle school. Not only is this book all kinds of fun, but it educates girls without coming across as preachy or stiff. It reads more like a conversation with a friend than the self-help manual you might expect. If there’s a teenage girl in your life, I highly recommend picking up a copy of The Girl Guide to give to her. Check out what my fellow Bookanistas are up to today! Jessica Love joins the BY BLOOD by Tracy Banghart book blitz – with giveaway!